Downtown Gadsden- Next Friday, April 7th, is First Friday! Downtown Gadsden, Inc. invites you to head downtown and help officially kick-off the season! Gather your friends and family and join us in Downtown Gadsden from 6 pm-9 pm as we showcase our beautiful downtown on First Friday. Walk around and explore our great shops and boutiques, dine in our local restaurants, explore our local art galleries and museums, enjoy live entertainment and discover all that is great about Downtown Gadsden. 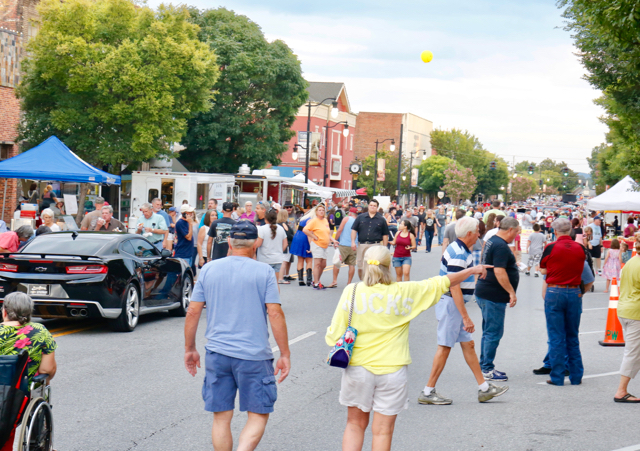 Food vendors will line the 400 block and Classic Cars will be on display. You won’t want to miss it. You never know what you could discover. A night full of wonderful entertainment is lined-up; South Ridge at 3rd and Broad, DieDra the Blues Diva at 4th and Broad, Sherwood Seven at 5th and Broad and New Delusions in the 600 Block. We hope to see you there! The Gadsden Museum of Art will have a reception for three current exhibits during First Friday: Founders: Peggy Gillam and Sara Reaves, Selfies by Kathryn McGinley, and our 2017 Student Exhibition featuring over 400 works from Etowah County and City Schools. Exhibits are free and open to the public. Light refreshments will be served. The Mary G. Hardin Center for Cultural Arts and Imagination Place will be open late for First Friday. On view upstairs in the Chan Gallery is “Tales” by Katherine Ace. The exhibit, Super Kids Save the World, is currently open. Super Kids Save the World gives kids (and their parents) the power to go green! Designed with sustainable materials and practices, this super exhibit gives kids real superhero training starting with the four R’s: Reduce, Reuse, Repair, Recycle! The Courtyard Summer Concert Series has also started back. Peanut will be playing R&B and Motown favorites in the courtyard from 7-9 pm. As a reminder to all, pets are not allowed at First Friday.